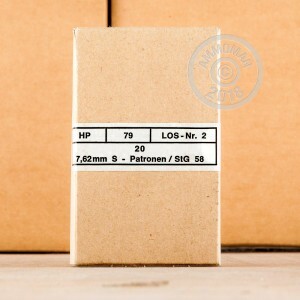 Own a piece of history with these Mil-Spec 7.62x51 NATO rounds by Hirtenberger, produced in the 1970's! 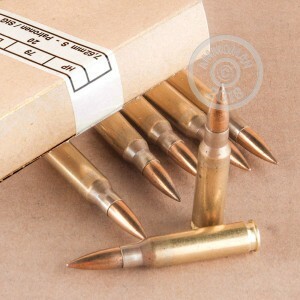 These Austrian cartridges are great for use in your modern 7.62 NATO or 308 Winchester rifle. The 146 grain full metal jacket projectiles chamber nicely and are great to take out on a day at the range. They have a magnetic, lead-core bullet. They are brass cased and contain Berdan primers, but are non-corrosive. Obviously, since they were packaged in the 1970's and are still in such great condition, they truly are non-corrosive. No better test than that! This Hirtenberger ammunition is some of the best in the world. It's a rare opportunity to get your hands on ammo like this. Hurry and get your 960 rounds before someone else does. I ran about 400 rounds though my M1A With no issues love them will buy lots more. Just received my order, and the ammo is absolute clean and looks virtually new. Could not be happier! Excellent ammo at a great price. This stuff looks as thought it was just manufactured yesterday. I just had to grab the 960 pack. Thanks AmmoMan for amazing fast shipping. Customer service is great. Excellent ammo for range day. Great price and quick shipping. Ordered on a Sunday and received it on Friday. Ammoman is the best place to buy ammo. Excellent buy! Shooting with M1a. Couldn't be more satisfied with this surplus. Fast shipping, good value ! My Oracle .308 likes them. This ammo runs a little hot not made for a hunting riffle better run a heavy riffle ..
runs fine in both my scar 17s socom 16 and savage .308. Running timmeny triggers with the heavy spring in the scars. I honestly haven't even cut the band on the case yet. It could be 6 bricks in there for all I know! But I got the ammo in 7 days. I waited 40 days on an order from Freedom Ammunition , and then was refunded because I asked when it could be expected! I then found Ammoman and their site and pics are superior to most out there. I had never heard of this stuff before, but sure sounds positive!!! Great ammo at a great price! Great ammo at a great price. Shipping was super fast. Wish the supply would last forever! Great Ammo at a great price! I've only fired a few rounds of this ammo but it seems to cycle well through my rifle. Haven't had a chance to confirm the accuracy yet however. I would definitely recommend this ammo to anyone wanting large quantities of .308 / 7.62x51 ammo for practicing. I fired 400 rounds on a hot/humid afternoon through my Springfield M1A without even a hiccup. Case came sealed with boxed rounds in a plastic heat-sealed covering. All rounds in pristine condition as if they were produced the day before. I held a grouping at 500 yds within 2-MOA, and up to 800 yds consistently within 4-MOA. Greater distances unchecked due to affects of heat/humidity in target visibility. I would buy again without hesitation. no issues when shot through my m1a. would by this ammo again. Great ammo, clean, and very accurate. Will be buying this again. We think it is one of the best surplus ammo we have shot yet. Very satisfied with the price and the quality. Will buy more next retirement check. My M1A loves this. stuff. Excellent ammo. Get this stuff! Great price. Great service. Came in sealed pack( Nitrogen, I assume) two days after I ordered it. No rust. No defects. First 240 rounds all fired first try. Saving the rest for the next couple trips. Battle sighted my M1A and was consistently hitting 6inch target at 200 yd on iron sights. I am no expert, but this ammo is a deal and a half. Shot 220 rounds over the weekend with my scar 17s and didn't have a single Misfire. Bullet is accurate enough for me and clean. Fast delivery great price. I got 1975 lot looks brand new will order from ammoman again. These grouped at less than MOA at 500 and 900 yards. I will be getting more. I put 100 down range last weekend with no problems. Clean, accurate, powerful & no nonsense. Shipping was lighting fast. Well worth the money. I will order more at some point. The bullets are magnetic, I'm not positive if its a steel core, or bimetal. The brass is non reloadable so you won't spend half a day searching (like I do ....) for that last piece thats lost forever. This is early 70s surplus. My ammo didnt arrive as "pretty" as everyone elses. Maybe I just have bad luck. Almost every round had some oxidation/rust on the cartridge and projectile. Didn't want to deal with the hassle of returning or exchanging it so I'll have to tumble or clean it some other way. Super bargan. Really good ammo. The first order had a mildew smell to the cardboard. I sealed those battle packs in plastic ands that took care of it. This next order had no smell. This is the stuff for your FAL and G3 types. Get some! Great ammo for a great price! This ammo is from the 70s, but appears to have been well stored - perhaps in nitrogen filled barrels. I have fire about 700 rounds through a Rock River LAR-8 Elite Operator. Not one problem of any sort. The ammo is very reliable and consistent. Groupings have been in the 3/4" to 1" range at 100 yards. I will be shooting them at 200 yards soon and expect similar performance. Excellent ammunition and you can't beat the price or service anywhere else. I will for sure be stocking up on some more. Great stuff. This a a great opportunity to own high quality military ammo designed for the FAL and G3 rifles. Hard to beat the quality. Only drawback is that the cardboard packaging has picked up a strong mildew smell. It was so strong that I had to pull the cardboard battle packs out of the original outer box and seal them in plastic with my vacuum food saver. This actually makes a better than new product as the 240 round battle packs now are also waterproof. So there is a silver loning ro the problem. This is my first purchase with AmmoMan; I am pleased with the service. Although quite musty smelling when the ammo arrived, it worked great in my Ruger M77 Hawkeye. It's fairly clean ammo and true to NATO specs., it's a bit on the hot side. I'm thinking about picking up another 1000 rounds shortly. Excellent Ammo, great condition. Shoots well. I hope to buy some more of this Hirtenberger, Really nice, as good as any DAG surplus. I was impressed by the condition of the packaging and the rounds. I was even more impressed by the performance. Nice tight groups at 100 yds. through my AR 10 and no cycling failures. Just a little dirtier than commercial rounds but, not a problem. I will shoot this stuff anytime. I live in Silicon Valley and take a lot of new shooters out for the first time. I keep a look out for good vintage ammo like this as a way to keep my costs down and let my friends have a little fun. I've been working my way through some mid-80's Brazilian NATO (great too) I got a while back and it was time to restock. This stuff is PRETTY and shoots nice tight groups. First, I was impressed by how clean all the packaging was. It looks like it had been stores in nitrogen purged barrels. No oxidation on the paper or on any of the rounds. At 100 yards it is point and shoot with all the paper getting holes and soda bottles dancing nicely. Guess I am going tobuy more. With the cost of ammo, this is a great overall price. Ammo is very clean and all that I've checked has the same case head production of '72. Bright and shiny like new production ammo. Plus this is the most accurate surplus ammo I've shot although I have not shot this batch yet. The M1A has no issues with this ammo. The SCAR 17 fails to ignite the primer on first strike 30% of the time. The rounds to go bang on the second strike.